Jarakan Waterfall is located in Ngancar village, Plaosan District. This Jarakan Waterfall as part of Waterfall tourism object area that developed by Magetan regency government. 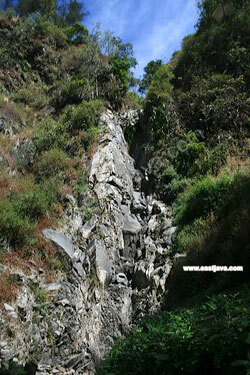 Jarakan Waterfall is located about 80 meters above Watu Ondo Waterfall. With its waterfall height is about 35 meters. In this waterfall base there is small pool where the tourists can take a bath or clean face. In the near of Jarakan waterfall, lied pasir mas ( pasir means sand and mas means gold ). Pasir mas is a small pond, this pond will reflected goldie yellow light when it is lightened by the sun.